There are a million books on negotiation but busy executives don’t need a book, they need a cheat sheet! I offer these tips based on buying & selling businesses, negotiating with unions, negotiating with venture capitalists, turning around a software group and best of all winning arguments occasionally with my two teenage daughters! We negotiate every day of our lives: sales meetings, staff salaries, policy changes, vacation locations, budget cuts, acquisitions. Life is a negotiation. I’m framing this advice around a major commercial negotiation between two reasonable parties. Always clarify the up to date position. e.g. you mentioned that a new sales order was imminent the last time we met, tell me more. Use questions to understand a specific stance, assumptions can be dangerous. On the other hand if you are relying on key assumptions in making a point e.g. the price of a company, please state clearly the main facts you believe to be true including forecasts to allow yourself an escape route if circumstances change. Be yourself which in my case means never bluffing. Don’t try to be smart e.g. with respect it is clear from your spreadsheets presented that there is a flaw in your numbers. Watch body language very carefully especially of the people not talking. Difficult issues should be put to one side to keep the momentum moving forward. Use time outs sparingly but effectively to gather your thoughts and garner input from the team. On big points please believe in what you say. It will show. If advisers are involved it is highly recommended that on really big points you deploy the “Principals Only” tactic. e.g. 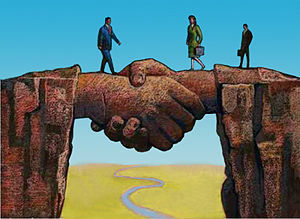 the acquirer and the seller excuse themselves to retreat to a separate room to agree a deal on that key point. The word “help” is underutilized. As in, perhaps you could help me understand how you win the majority of your business. Rudeness and sarcasm don’t work even if you’re British. Document agreements along the way and make great theatre of the volume of points agreed. Close on clear next steps with a timetable and agree action for non-compliance.